Allure Couture, style C404: Our featured dress (pictured above) is a slim-fitting silhouette that features dimensional detailing, cinched at an empire waist. 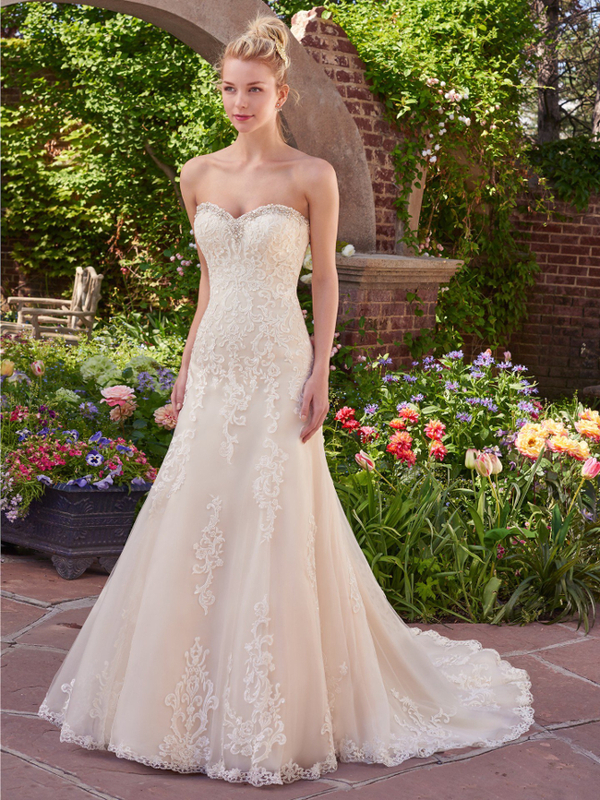 The delicately scalloped neckline offers a romantic edge to this lace and English net design. Available sizes: 2-32. Available colors: Latte/Ivory/Silver, Ivory/Silver, White/Silver. It’s amazing how the neckline of your wedding dress can completely change your entire look (and also how you feel about a gown). 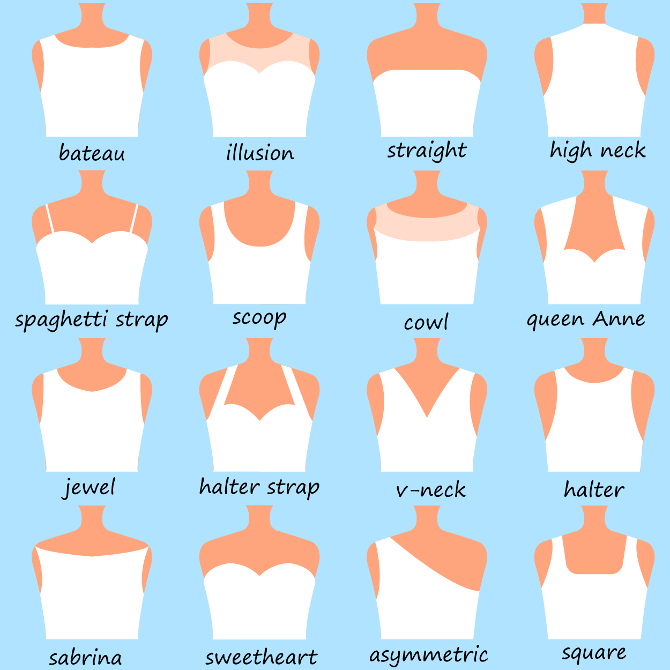 The width, lay and style of the bodice and associated straps (or lack thereof) define your upper arms, back, shoulders and décolletage. It can even influence how elongated your silhouette becomes right down to your waistline. Our experienced Bridal Consultants at NYB&G of Raleigh can help you find the neckline that perfectly complements your size, shape and personal style. Just like the name implies, this neckline sits below the shoulders to showcase a woman’s collarbone and shoulders, with sleeves that cover part of the upper arm. While this style is super flattering to medium- or full-chested women, an off-the-shoulder neckline will look good on almost all figures. But if you’ve got fuller arms and are uncomfortable with baring your shoulders, you may wan to consider a portrait neckline instead. Rebecca Ingram, style Vernice: Gorgeous lace appliques enchant this tulle A-line, showcasing a sweetheart neckline trimmed in Swarovski crystals and delicate pearls and beads. Bodice features a corset closure or inner corset closure and covered buttons over zipper. 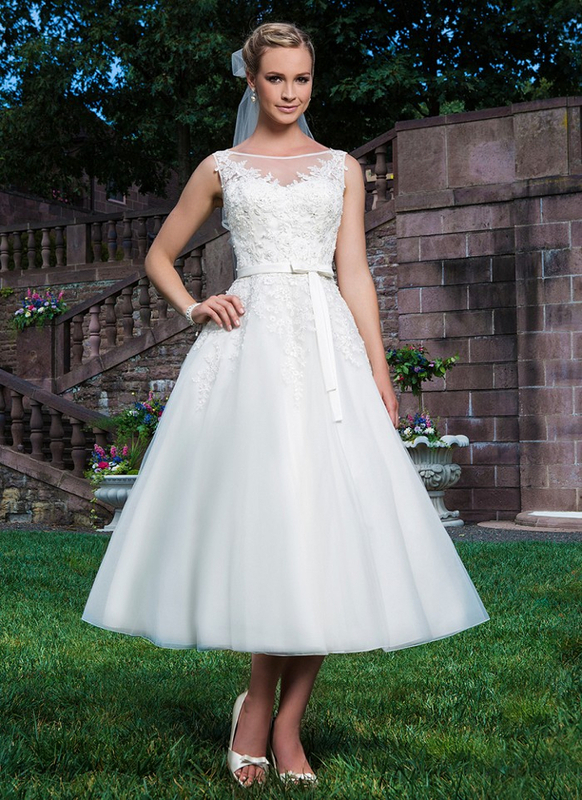 A scalloped hem completes this mesmerizing gown. Available sizes: 0-28. Available colors: White, Ivory, Ivory over Light Gold (pictured). The sweetheart neckline — which is actually shaped like the top half of a heart — is a wonderful option for fuller-chested women because it really accentuates the décolletage. The sweetheart is often done with an overlay of sheer material that rises higher than the heart shape, giving the torso a longer line and also making the neck look longer. This shape gently follows the curve of the collarbone, almost to the tip of the shoulders — and it’s cut straight across so less of the decolletage shows. It can be paired with sleeves or a sleeveless style. Sincerity, style 3855: This embroidered and beaded lace and tulle tea-length ball gown offers a sweet sabrina neckline. The plunging back finishes with fabric buttons harmonizing with an elegant bow to define the waist. Available in Ivory (pictured) and White. Our 17,000 sq.ft. modern luxury bridal salon is filled with exquisite dresses in every style. We will help you try on a variety of wedding gown choices showcasing different necklines, silhouettes and lengths until you fall in love with The One! Stop by New York Bride & Groom of Raleigh (no appointment needed) to see why our inspired designs at popular prices set us apart from the rest.